As I sit out on the balcony this morning, the bells from the Duomo (cathedral) are ringing. It is a European and Italian sound that hopefully will endure the ages. 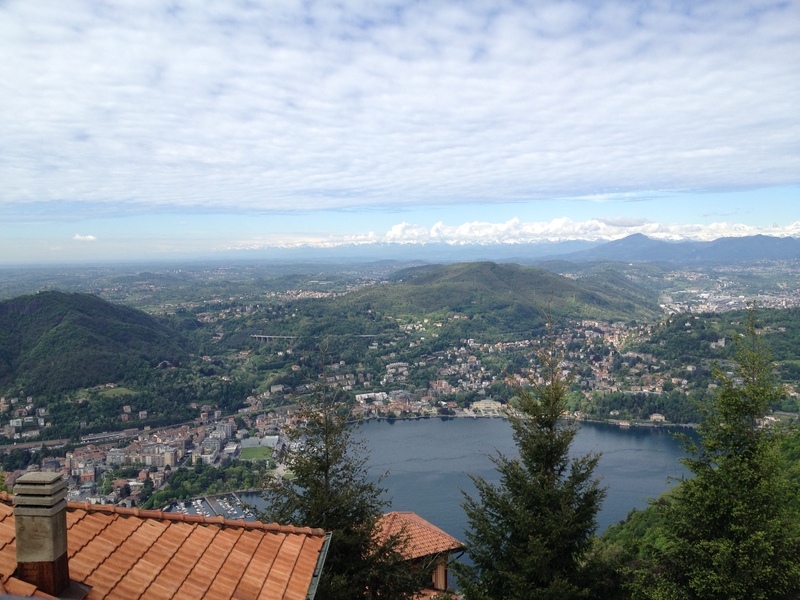 Our stay in Como has been wonderful. 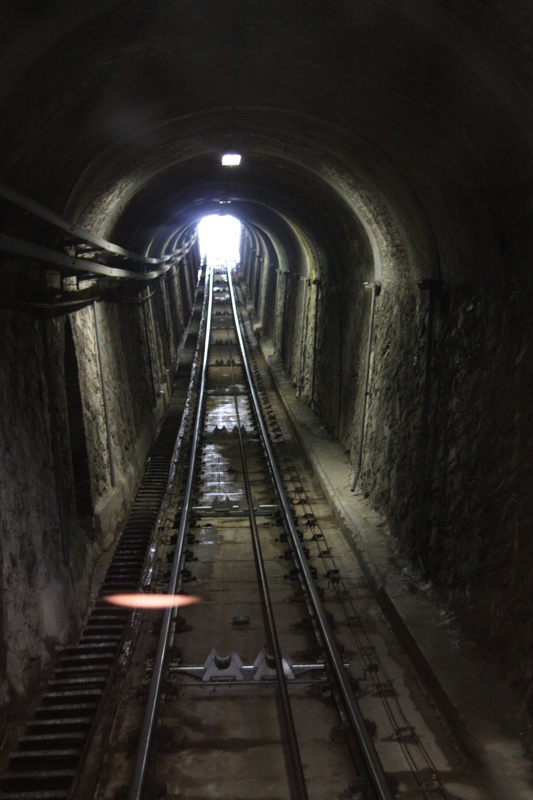 We have a great view – which, of course means a “great” climb. 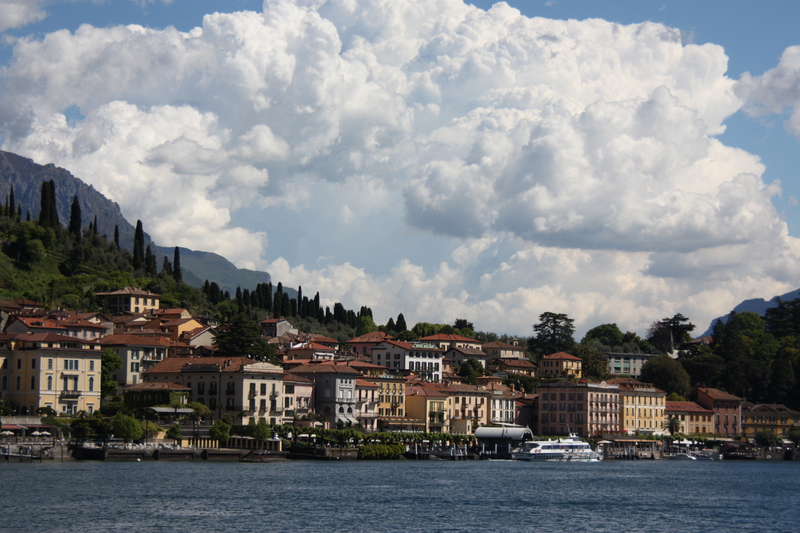 Yesterday we decided to go to Bellagio and then to cruise across to Varenna. 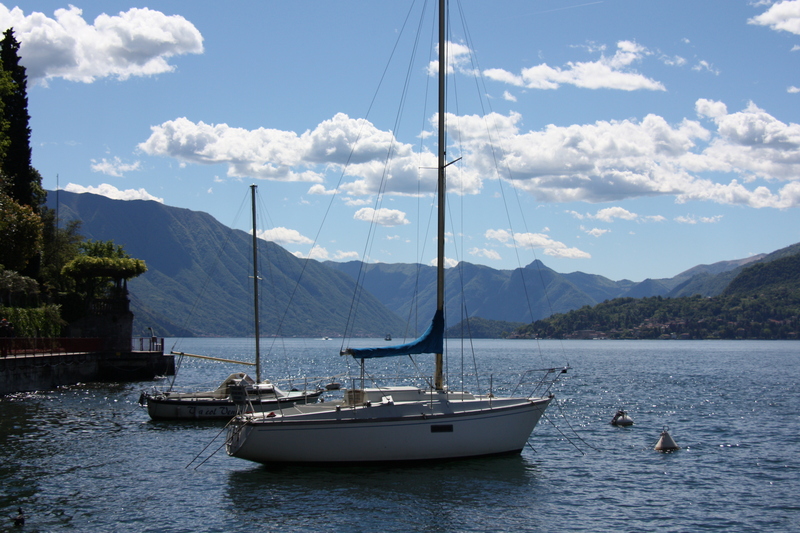 As we had hired a car in Venice to travel across to Como, we thought “why not drive?”. Having driven the 37.5 kilometre trip which took the best part of an hour, I can give you an endless list of reasons not to drive! And in fact, we were talking to our Airbnb host, Edo, after we returned and he couldn’t believe I drove there and back. 1. The roads are narrower than you can ever imagine in all the small towns you pass through. 3. there’s a bus and a boat, people! And here’s Edo’s top reason not to drive – Italian drivers. I was so busy driving that I didn’t have the chance to take a photo of the streets I drove on but that didn’t stop the car in front of me, slowing down to a stop and putting their camera out the window as they then drove on. 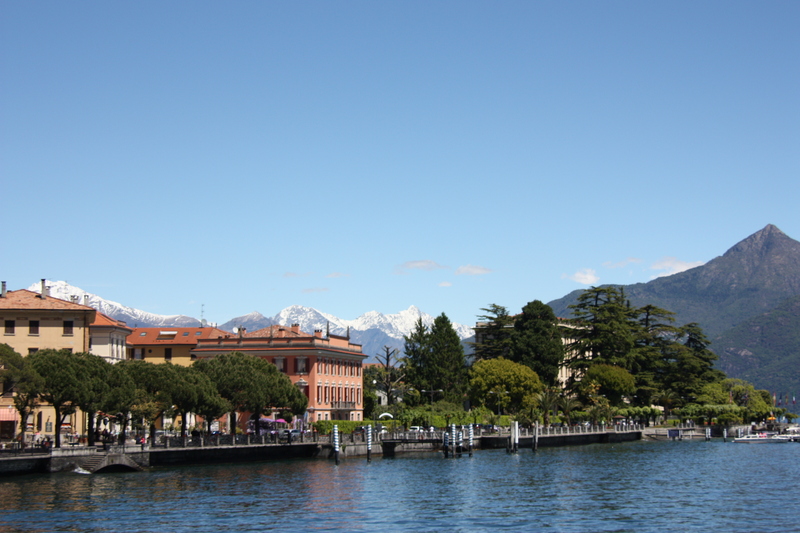 What I can say is that a trip on Lake Como, no matter where you start is worth it. 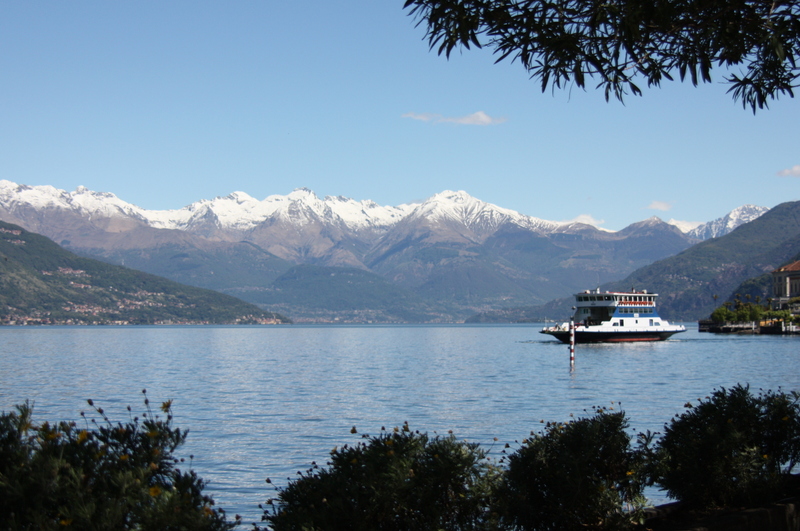 If you imagine an upside-down “Y”, Como is at the south-western end of the lake and as you go further up, the other branch joins up and you see the snow-peaked alps to the north – simply breathtaking. Here is the view at Bellagio. 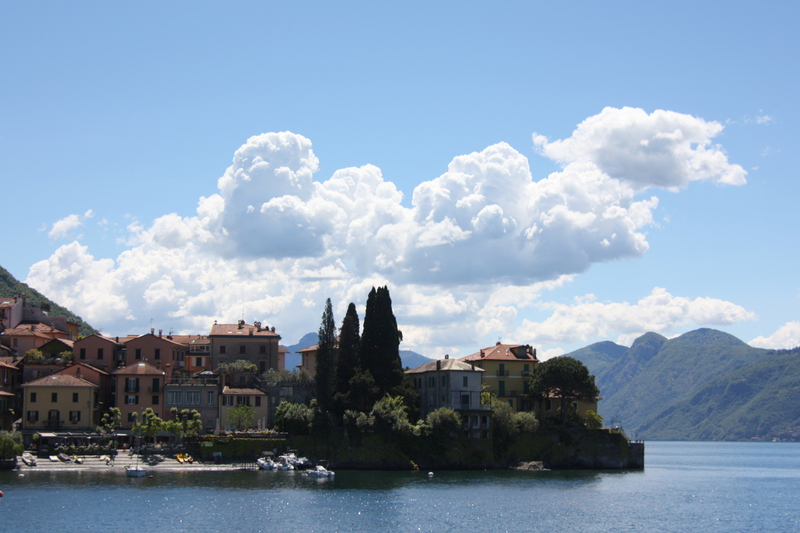 Isabella – Edo’s wife – recommended Varenna as the destination so off we went on a ferry. Our trip on the water was a series of picture-perfect experiences and the weather couldn’t have been better. 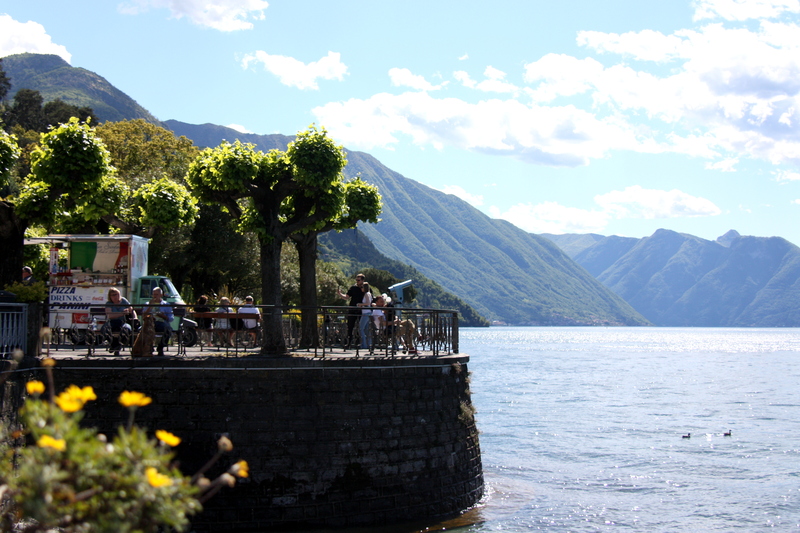 At Varenna I suggested a walk away from the pier to find a less touristy place for lunch – turns out there isn’t any so back down the hill we came to a lovely terrace. Here is the view from our table. After lunch we wandered along the shoreline to walk off a few calories – for Tony and me this meant walking off pizzocheri which is a dish of buckwheat pasta from the north of Italy from where my father’s family comes. 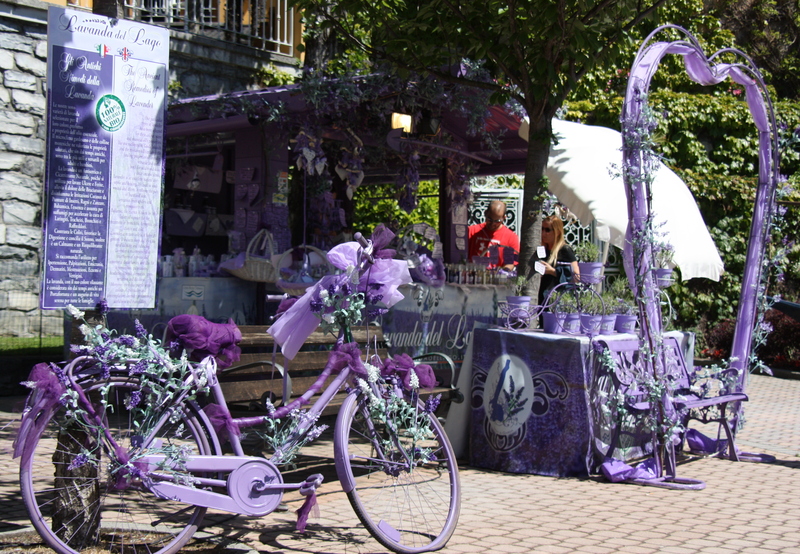 My instinct tells me this little shop was selling lavender-related goods. 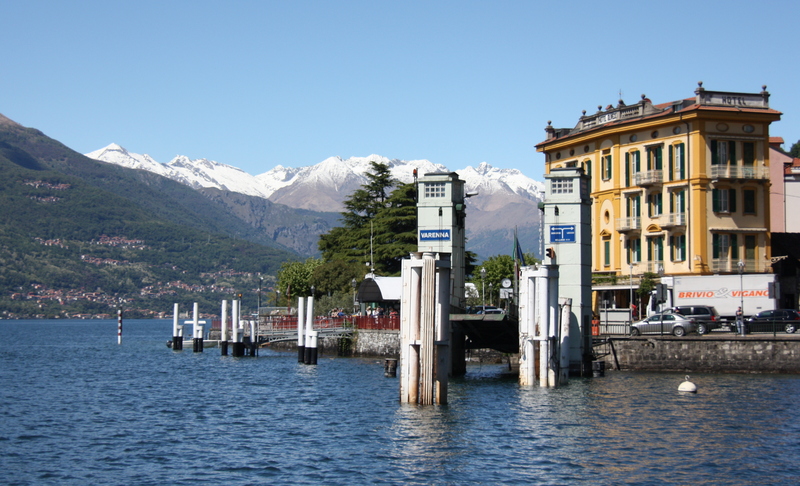 Then it was back on the ferry for our return trip to Bellagio – I couldn’t wait to get behind the steering wheel again! What a fabulous day. Our host, Edo, lives downstairs and he popped in to give us some information. He had kindly given us a bottle of his favourite red wine – Montalcino – and so we shared a drink with him and learned about his and Isabella’s life. This has been one of the best Airbnb experiences we have had. 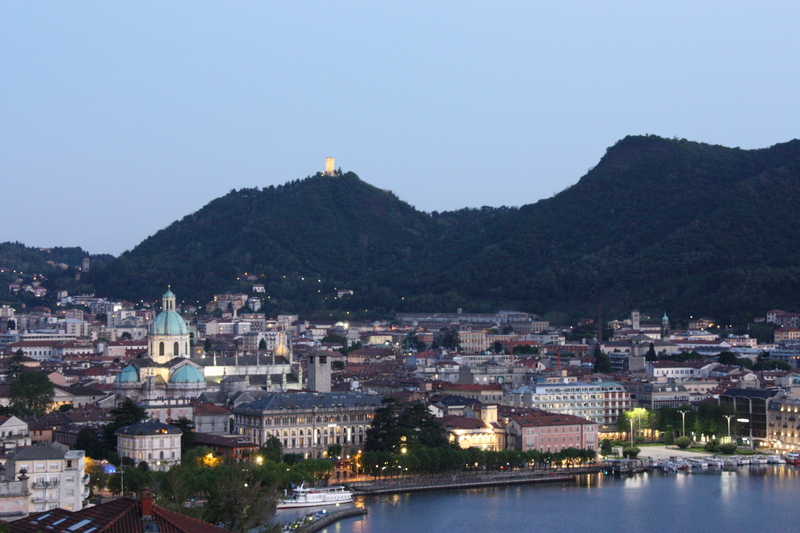 Then to finish the night looking out to the dusk lights of Como – perfetto! 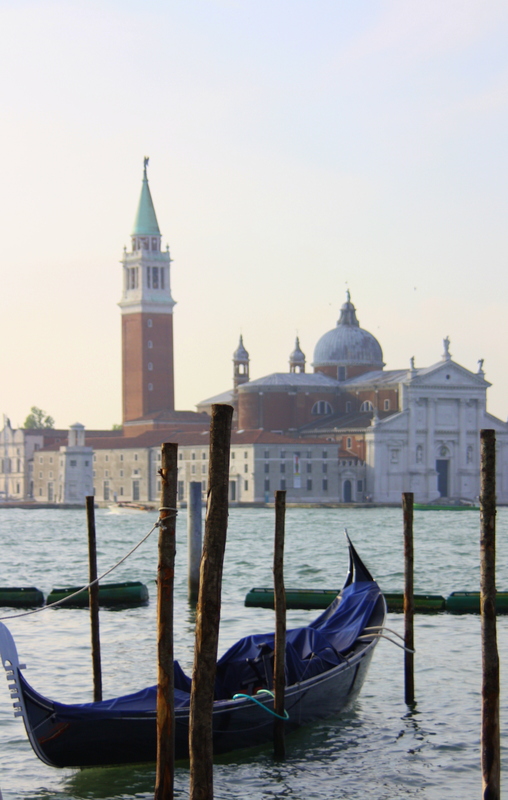 Venice is a magical city but for the locals, they can see their city being usurped by the tourists. 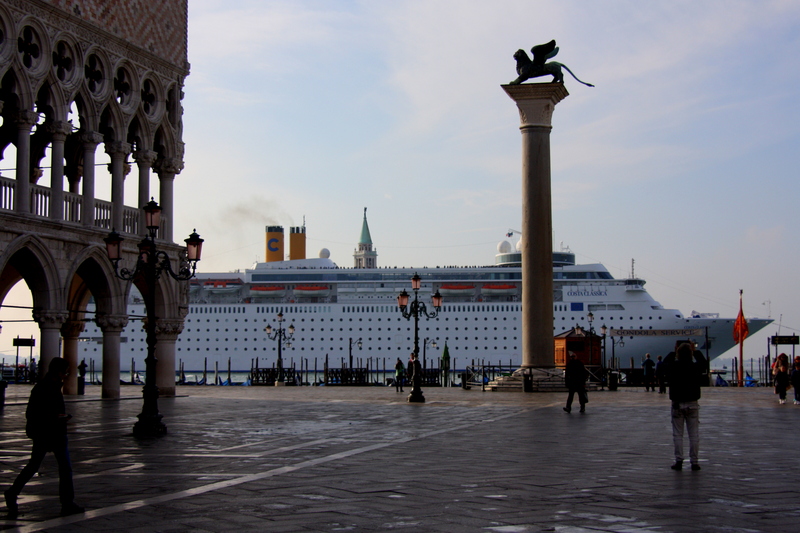 Just to get on a vaporetto (water bus) is a hassle and having a quiet walk to St Mark’s Square for a coffee? Forget it, unless you are prepared to be on your way by 7.00 am. 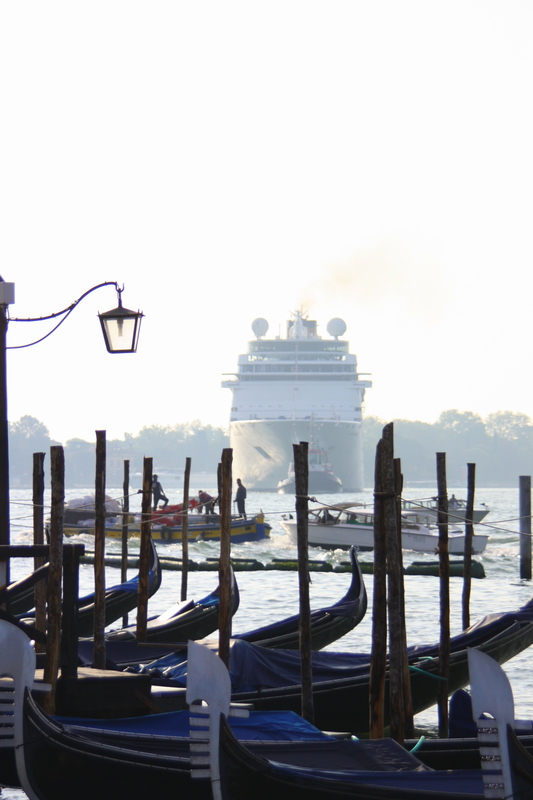 So it was with mixed feelings that I found myself in Venice again – with the locals leaving in droves and 150,000 tourists arriving every day. And yet this city still mesmerises me, with its maze of streets (calles) in which you can find yourself lost at the turn of a map. There is also something about the light – maybe it’s the salt water in the air but there is a softness to the light that means that almost every photograph you take is amazing. 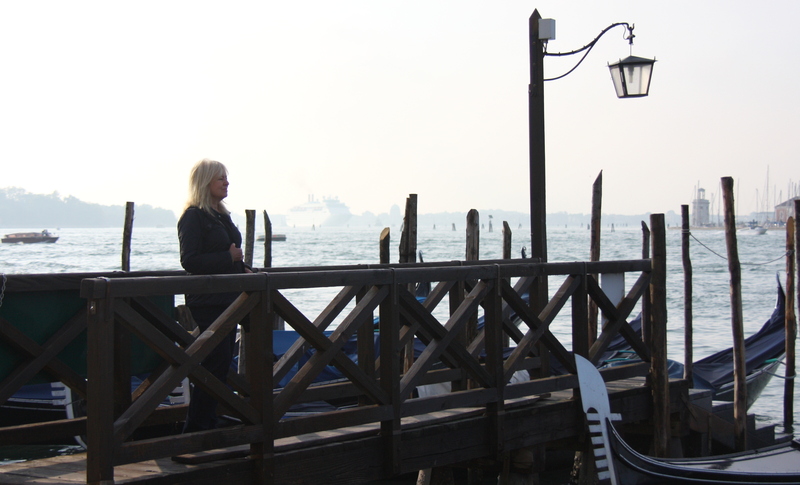 This was Helen’s first visit to Venice so when we arrived, I led her out of the train station onto the grand canal, with her eyes closed and when she opened them, she was astounded by the sight that awaited her. 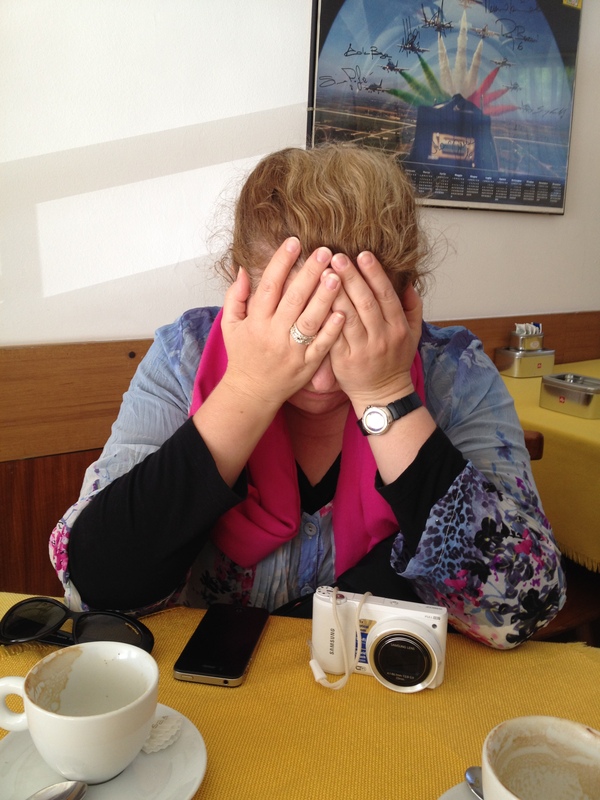 I stole this idea from someone who wrote about her first trip to Venice many years ago and I asked Helen if she would like to give it a try – as with the author of the article, the experience brought tears to Helen’s eyes. We bought a vaporetto ticket that enabled us to travel for 3 days whenever and wherever we wanted. 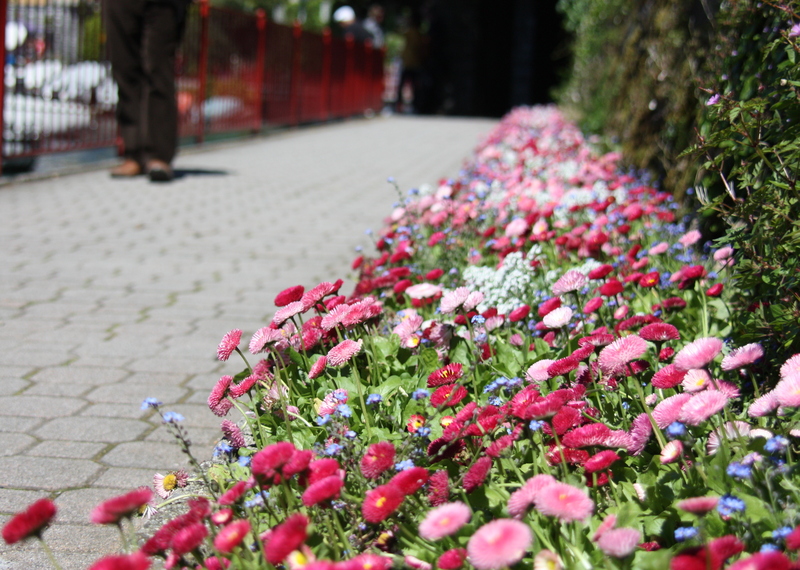 This, combined with our legs and maps, gave us the freedom to explore the city (and get lost). 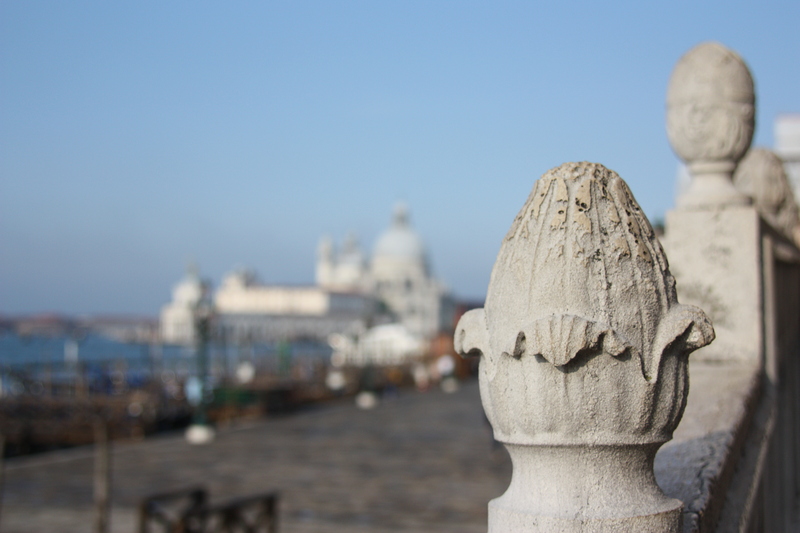 Near St Mark’s Square (Piazza San Marco) one of the places I had the opportunity to visit was the Doge’s Palace and it was amazing. The rooms are astounding – the largest being the Hall of the Great Council which housed up to 2,000 officials and is still one of the largest rooms in Europe. 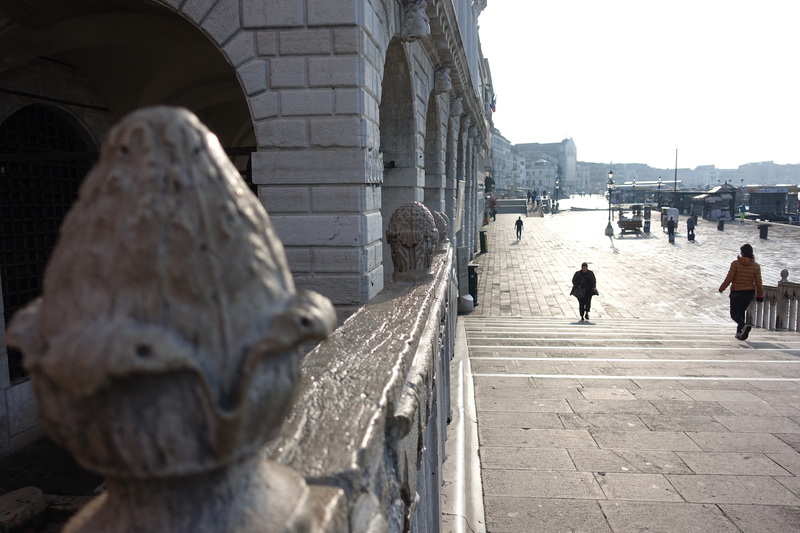 The Doge’s Palace also contained prison cells (Casanova was imprisoned here). There were other prison cells outside the Palace that were linked via the covered Bridge of Sighs – so named as prisoners were said to sigh as they saw their last view of the outside world through a small window in the covered bridge, following their sentence. Then there is St Mark’s Square itself – if you get to visit Venice, I recommend you go to this Square early in the morning – there are no crowds, you may be lucky to experience the fog and, as Helen and I did the other morning, you could see a film crew, a large cruise ship and the manner in which goods must be unloaded and delivered to enable the crowds to get the services and goods they expect. So now it was now time to commence the Italian leg of our travels. We left Paris, intending to walk up Avenue de l’Opera to catch the bus to the airport, only to discover it was blocked off. We noticed police cars on the back of trucks and thought it may have been a political rally ahead of the French presidential election but it turned out to be the filming of a scene from Tom Cruise’s next Mission Impossible movie. 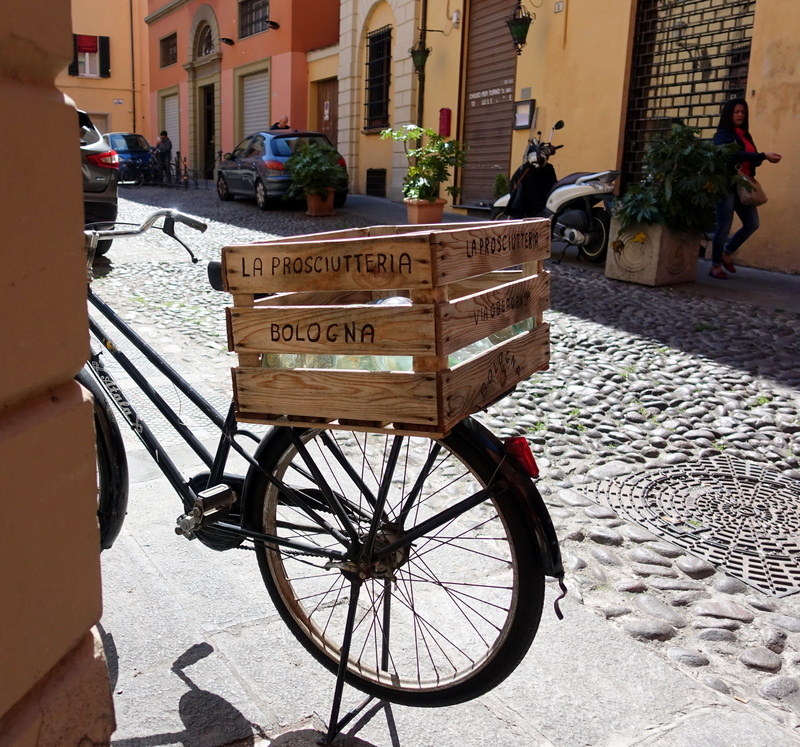 Our next stop was Bologna – via Milano – where we were to meet up with our friends Colin and Helen. We had a few days in Bologna which, on the whole we found somewhat underwhelming. We visited the old university which was founded in 1088. 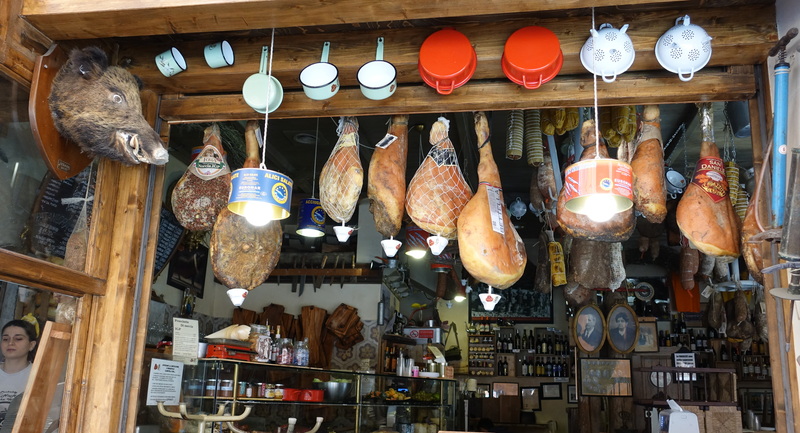 Bologna is well known also for its food and here is an example of a prosciutteria. 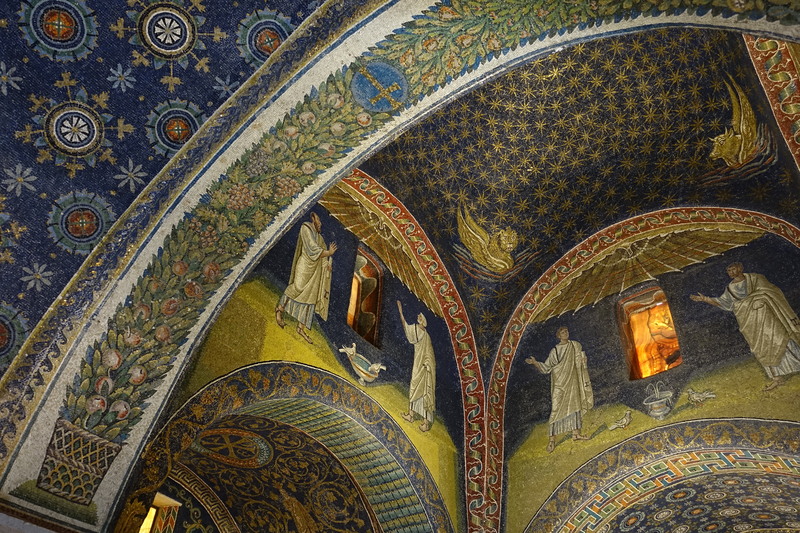 We decided to spend one day in Ravenna – a town famous for its mosaics. Upon arrival at the Bologna train station, we found long queues everywhere. It turned out the server for the ticketing system (based in Rome) was having problems and the result was the dispensing of train tickets was very very slow. We finally got our tickets and went off on our 1 1/2 hour train trip to Ravenna. 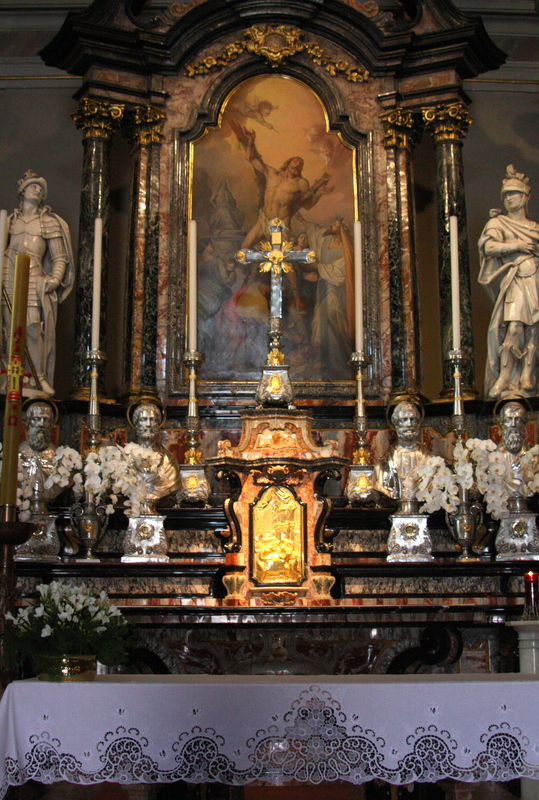 There are five churches you can visit and the order in which we undertook our tour meant we finished with the most impressive. The ticket price of 11 Euros is well worth it. We had a glorious day as we ambled through the old town centre. 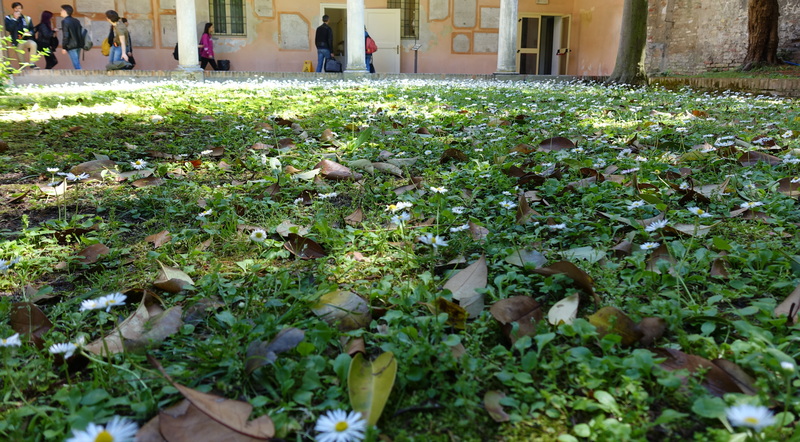 Ravenna is also the place of Dante’s death and you can visit his tomb. Dante is considered to be the father of the Italian language. Poor old Dante, he was banished from Florence in the early 1300s and it wasn’t until 2008 that the city council of Florence finally passed a motion rescinding Dante’s sentence (which was burning at the stake if he returned to Florence without paying his fine). We took a break in our viewing of the churches by stopping off for lunch in a lovely Osteria where we were well looked after. Then it was back to viewing the wonderful mosaics. We finished at the baptistry – the jewel in the crown. 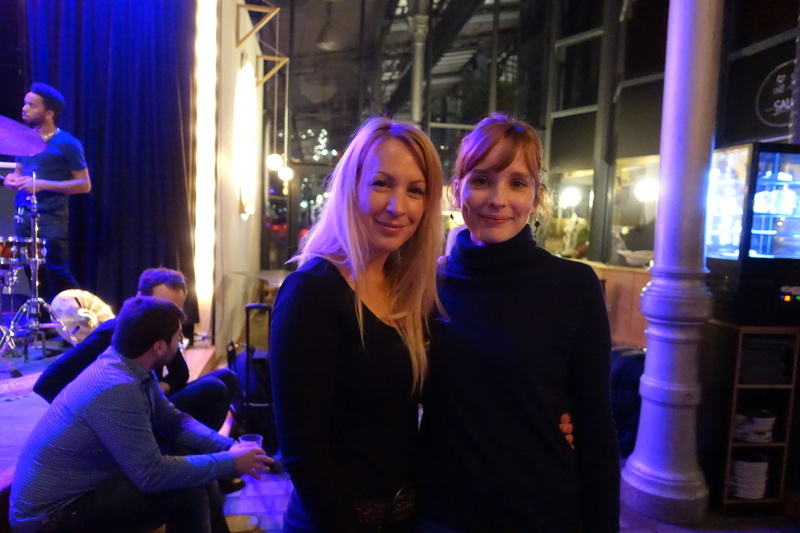 What a joy to be in Paris! But there were still so many things I wanted to see. Ah well, I’ll just have to return (again). However, in our last 24 hours in this beautiful city, there were a few things we could still see. 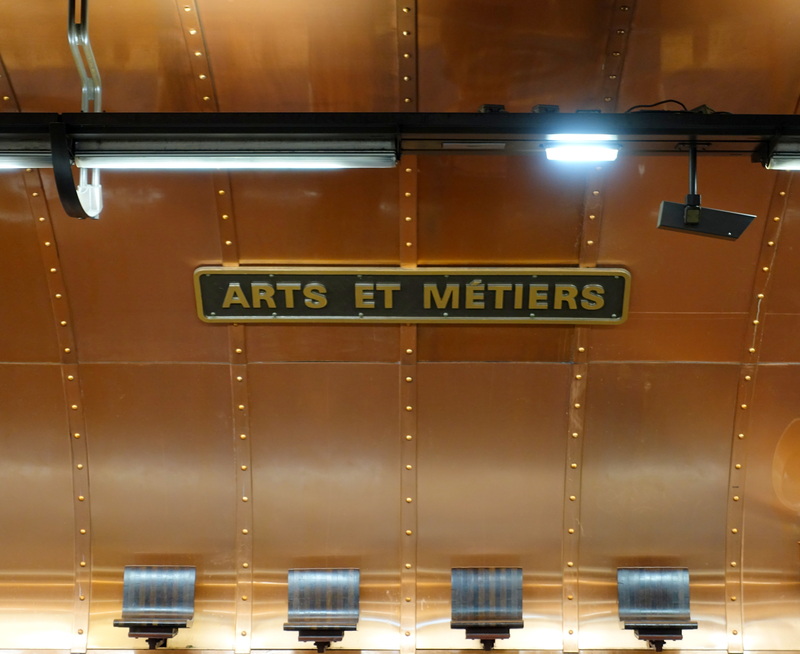 Ever since my last trip to Paris, when the metro I had been travelling on went through the Arts et Metiers station, I have wanted to walk on the platform and see the beautiful copper and details. This station is so named as it is near the Museum of Arts et Metiers. 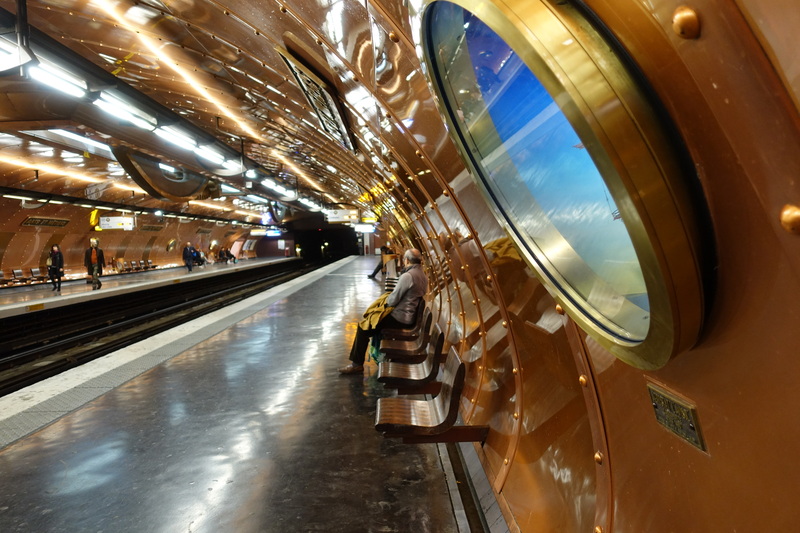 In 1994, the metro station was redesigned to take on the look of the science fiction works of Jules Vernes. We then walked on until we reached Rue Montorgueil, with its food markets and happening crowd – fantastique!. 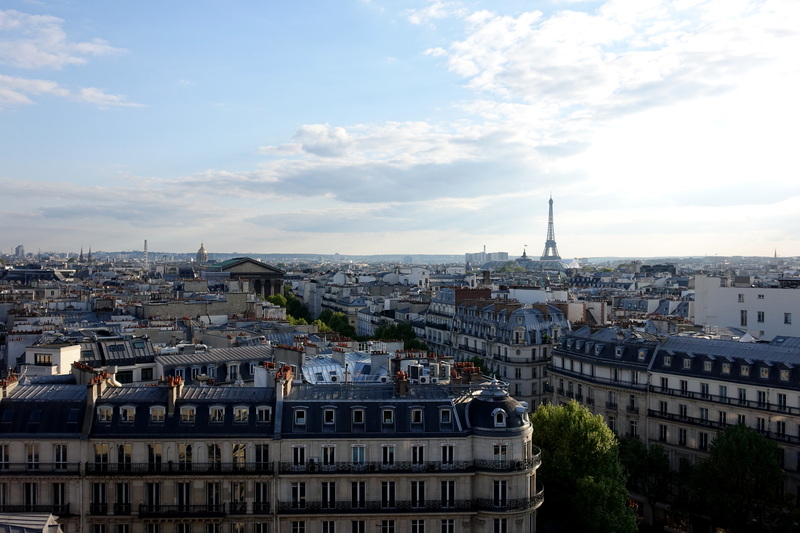 Our next stop was the Printemps department store where I had read you can see beautiful views of Paris from the rooftop – where there is a cafe. Now this I found didn’t live up to my expectations. To use a Canberra analogy, I would say it would be like recommending that someone go to the rooftop of a building at Fyshwick to look across to New Parliament House. But maybe I have just been spoilt by all the wondrous sites and views and, really, for a free view of Paris, this isn’t too bad? Then it was back to our apartment, in preparation for our departure late the next morning. 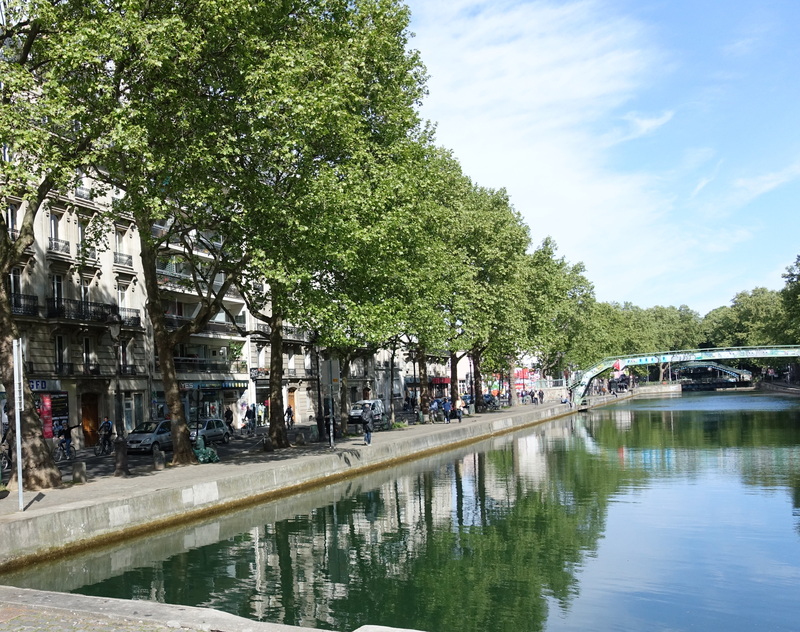 And when that morning arrived, we took a metro trip to Canal Saint-Martin.This 4.5 kilomtere canal still has a series of locks and barges travel up and down. 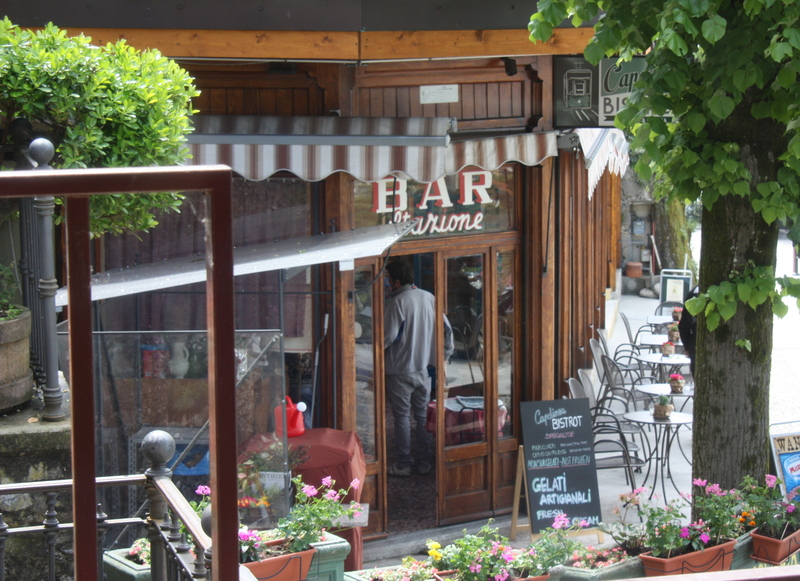 I believe the area was popularised following the release of the film Amelie. We enjoyed our walk and then finished off with a quick coffee, before collecting our luggage and heading for the airport. 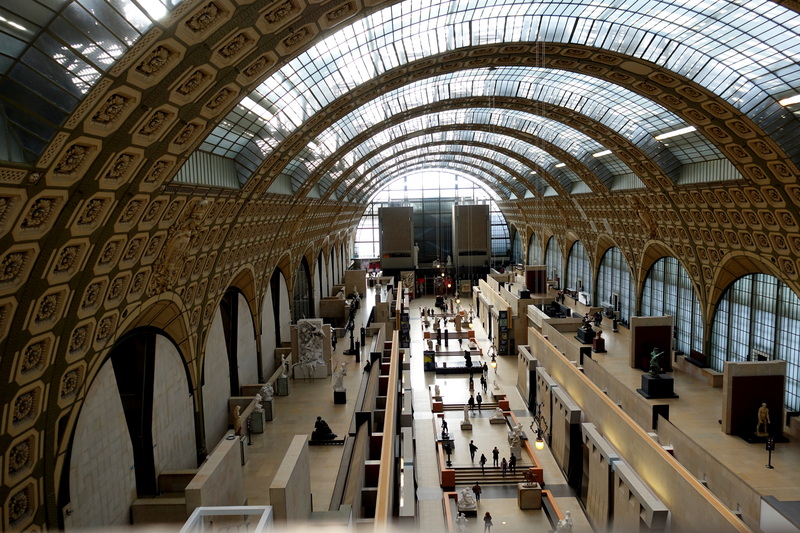 We had tried a number of times to get to Musee d’Orsay but for one reason or other, it took our third attempt to finally succeed. 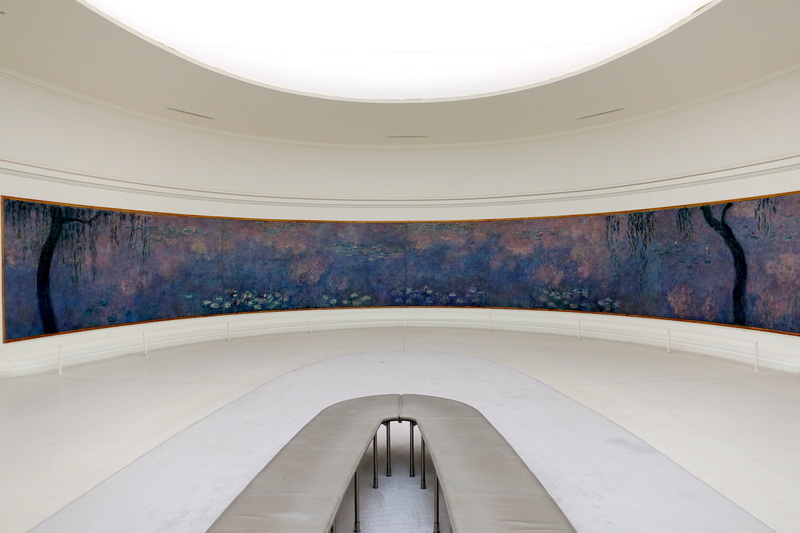 On this floor, you get to run through a chronological history of the Impressionist art movement. I overheard one of these guys saying to the other “I may not know much about art but I know what I like”. And at the other end of the (same) spectrum is this painting by Manet which caused an outcry at the time – and in fact still does. 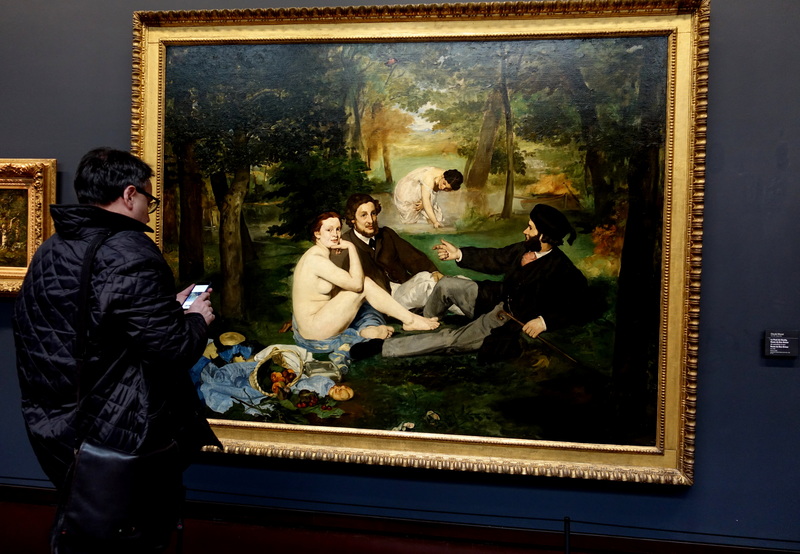 I write this post after having left Paris and visiting Bologna in Italy where I saw a series of posters cticising the objectification of women in art, with statements such as “Do women have to be naked to get into the Met Museum? Less than 4% of the artists in the Modern Arts section are women, but 76% of the nudes are women”. 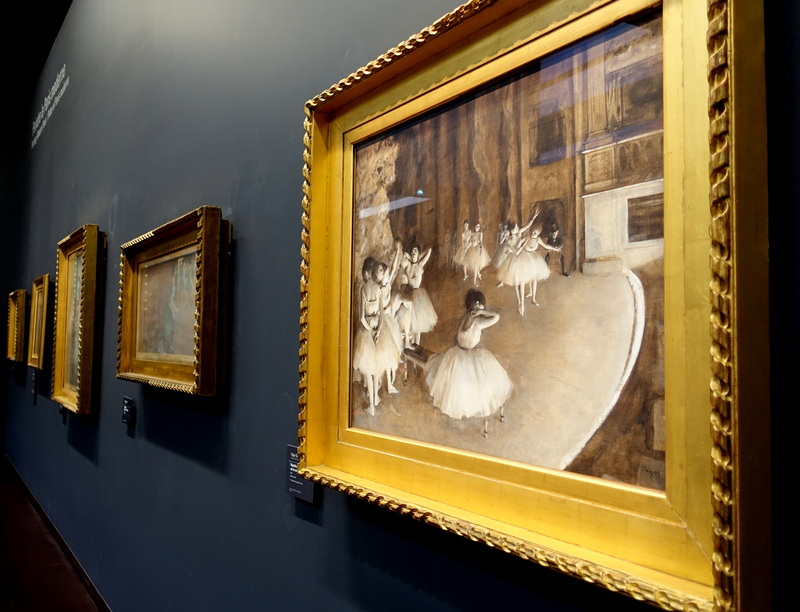 So whilst I’m not happy about the paucity of women artists and their treatment as objects, I still appreciate the talent of these artists at the Musee d’Orsay, especially some of my favourites such as Degas. 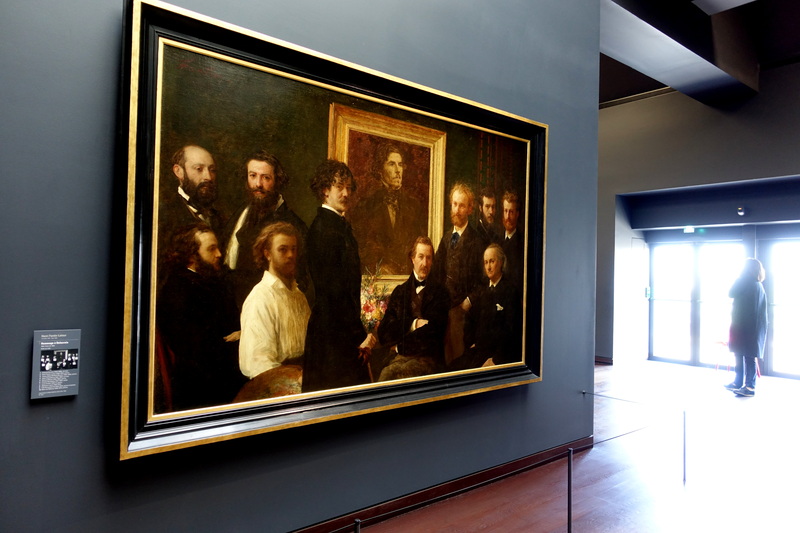 I do love a good Degas and there are plenty from which to choose – from both paintings and sculptures. 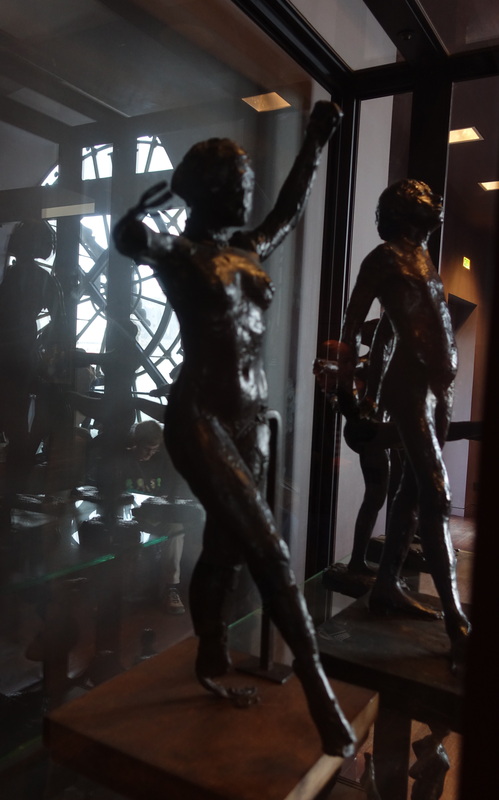 With regard to his sculptures, many wax ones were found after Degas’ death and they were then used as the basis from which to create bronze sculptures. 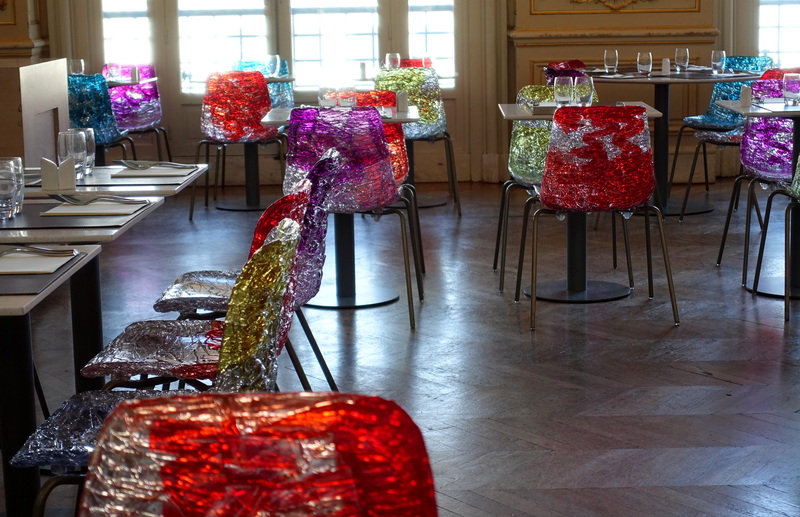 All this art critiquing and appreciating can make a person hungry and we had earlier eyed off the pretty restaurant as we wandered between floors. 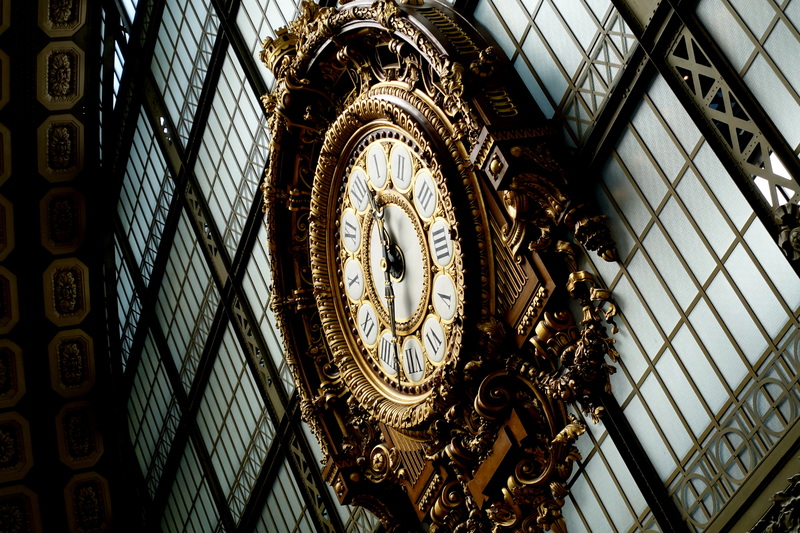 Anyway, a check of the local clock confirmed what our stomachs had been telling us – it was indeed time for lunch. And then as only any self-respecting tourist can do, we posed for our photo post-lunch. A perfect end to a wonderful bit of cultural exposure. 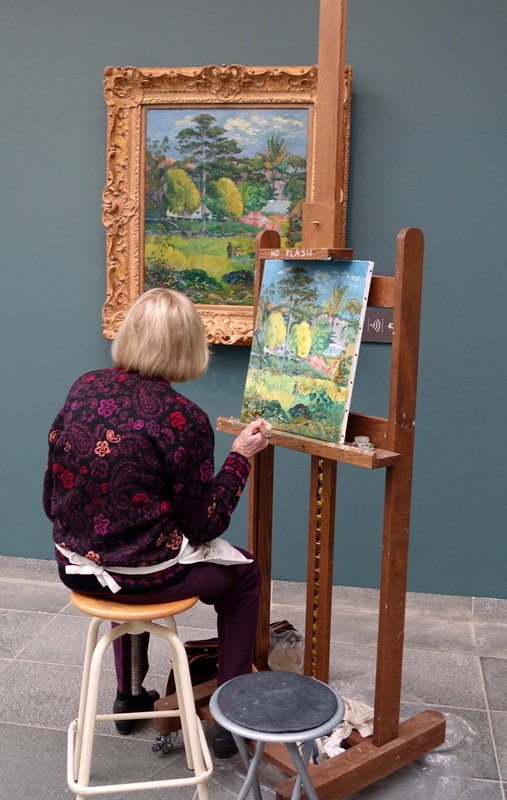 Our next day in Paris, we arose, looking forward to a day of culture – including the paintings of Monet and jazz music. 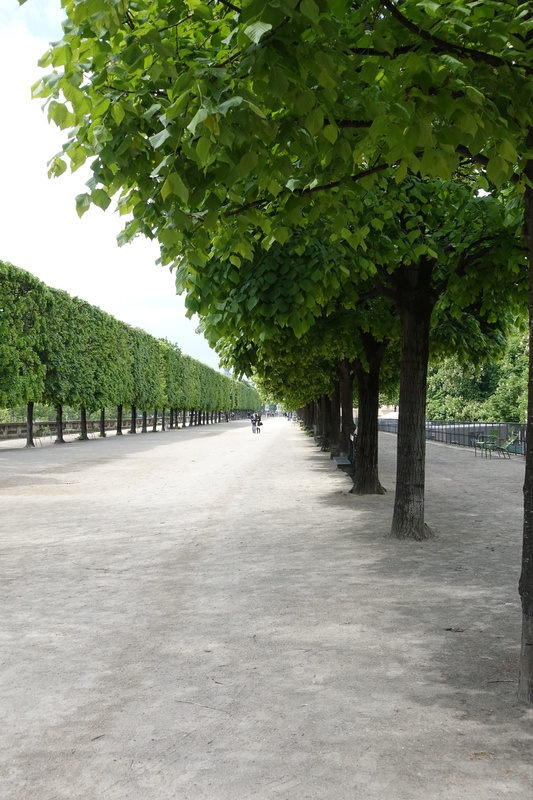 So we took a short walk to the Tuileries gardens where the Musee de l’Orangerie is located. One thing you can say about the French – they know how to keep their trees in line. 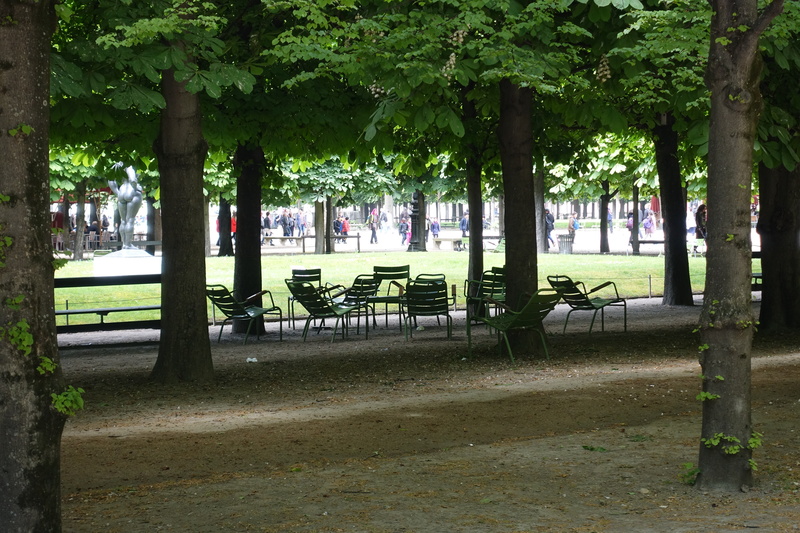 The Tuileries gardens are a real delight to wander through – and there are so many places to sit and enjoy the space which is so close to the centre of Paris. The Musee de l’Orangerie was built in 1852 to shelter orange trees of the gardens. On April 12, 1922 Claude Monet signed a contract donating the Nymphéas series of decorative panels to the French government. These paintings were to be housed in the redesigned, oval rooms at the Orangerie. After his death in 1926, the paintings were placed there. There also many other great impressionist works and budding artists have the opportunity to practise their skills. 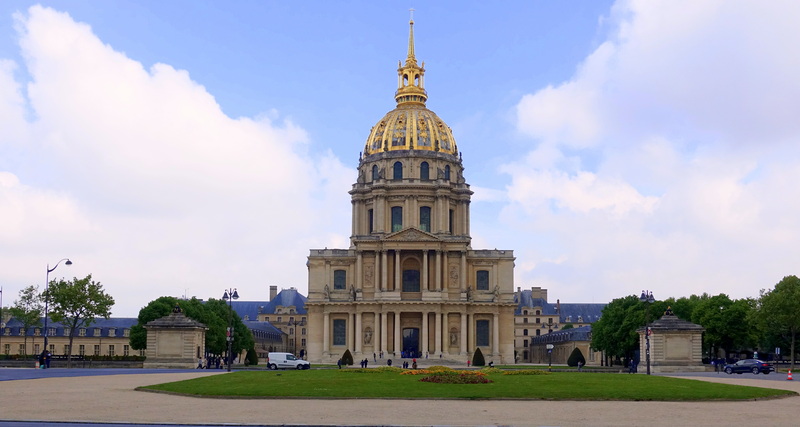 We then walked on to the other side of the Seine River to see Les Invalides which was a project commenced under Louise XIV – a home and hospital for old and injured soldiers. About a century later, on 14 July 1789, Parisians seized cannons and muskets stored at Les Invalides and used them later that day against the Bastille. 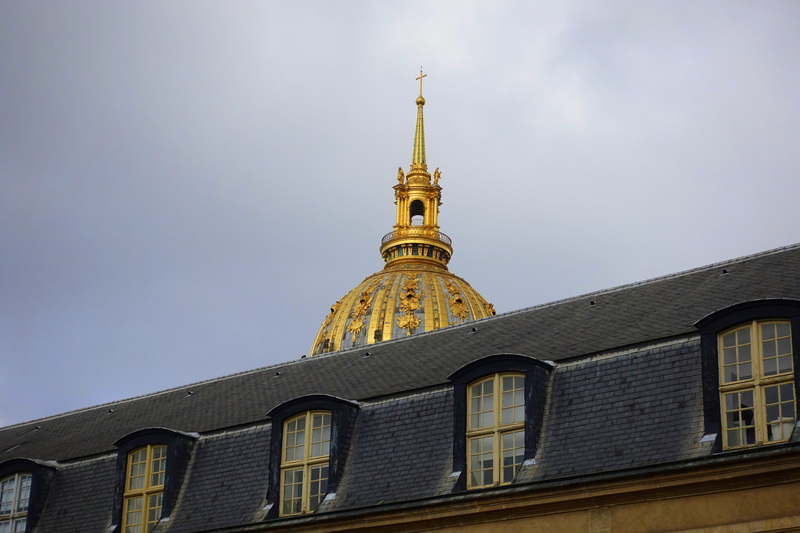 Then in 1840, Napoleon was entombed under the golden dome. 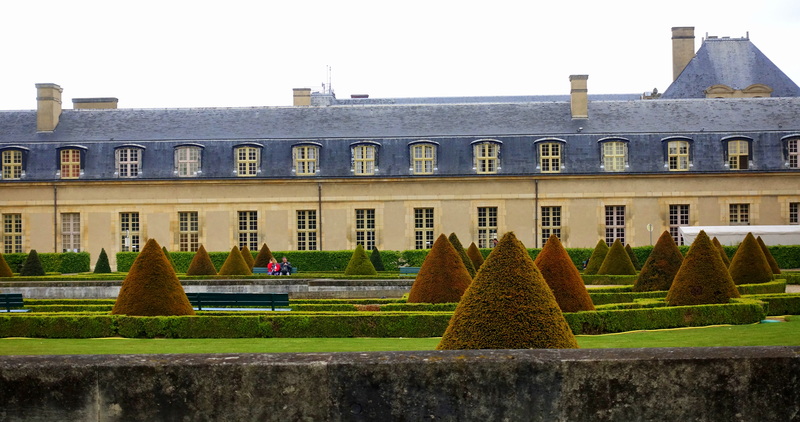 Les Invalides are surrounded by beautifully manicured gardens. 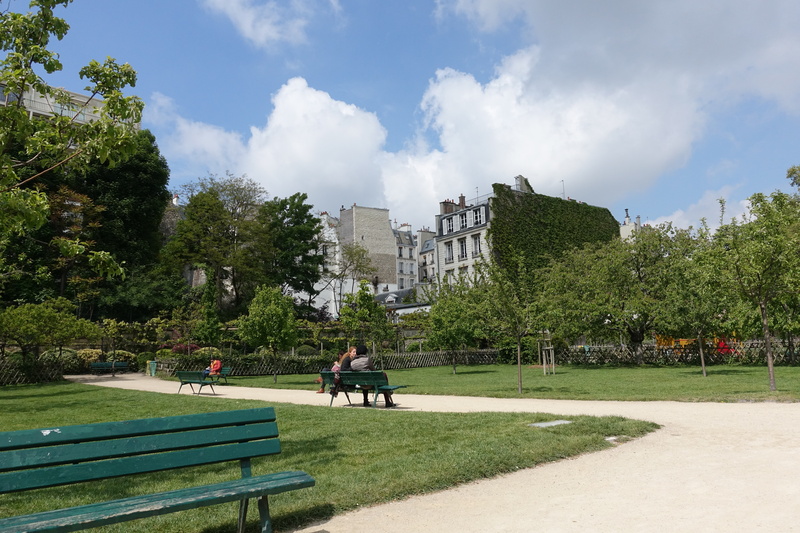 As we walked on through the nearby streets, we stumbled upon a lovely park where we enjoyed the sunshine and ate our lunch with the locals. 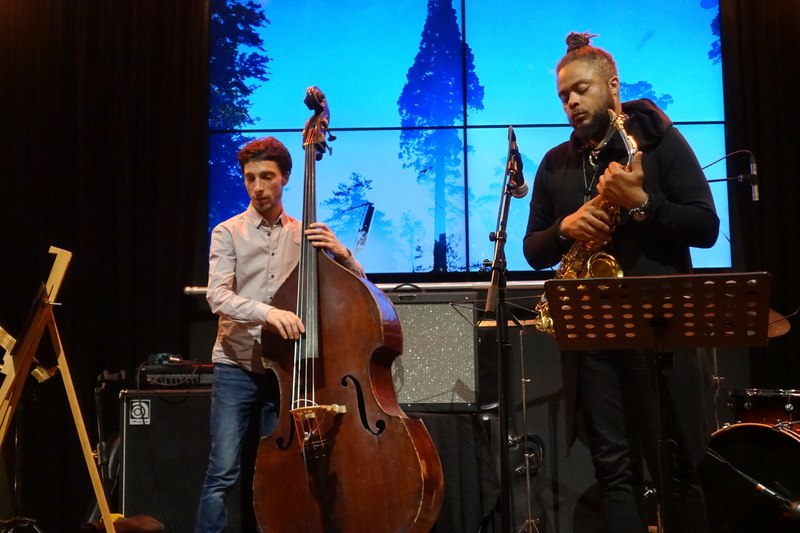 First we listened to Panorama Circus and then to Logan Richardson’s masterful playing of the saxophone. 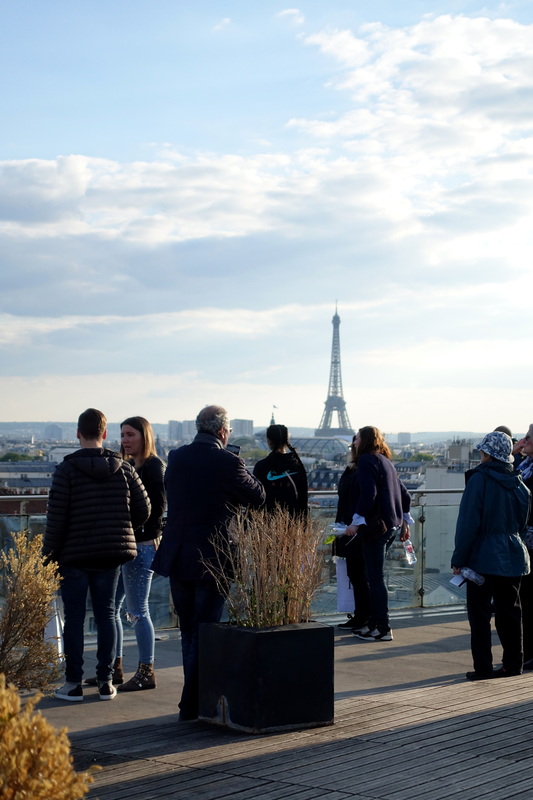 We enjoyed sharing this event with locals – another beautiful spring day in Paris. 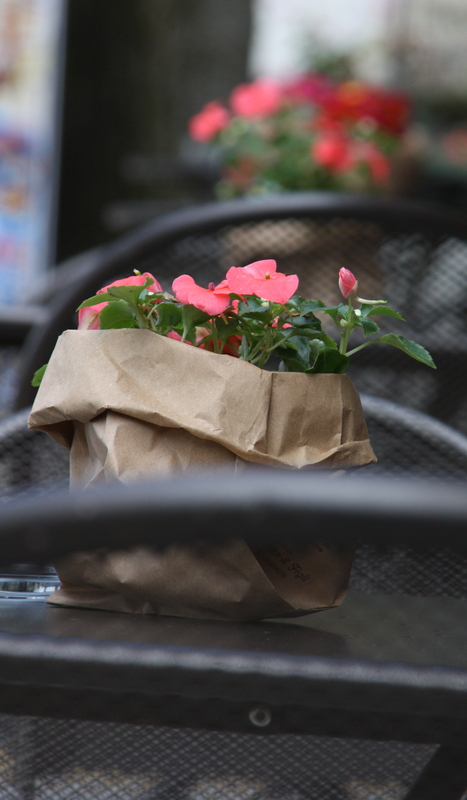 What is there to write about Paris in the springtime that hasn’t already been written? Well what I can write is how incredibly lucky I am to be here again – and at this time of year. 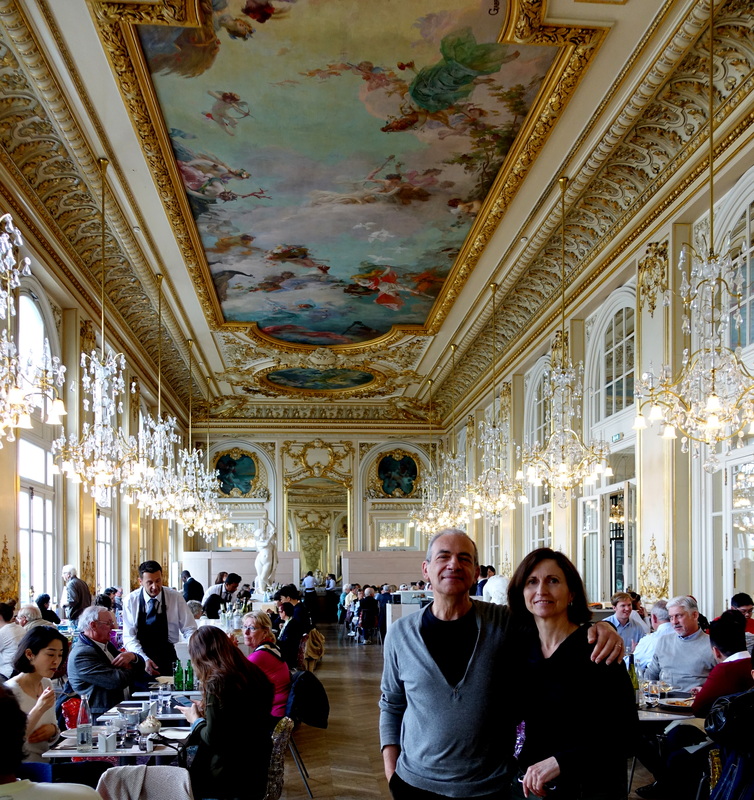 With only three full days in Paris, I had planned and thought about the places that Tony and I could go. On our arrival yesterday evening, we were met by Laurent at his apartment very near to the Palais Royal. He had warmed up the apartment as it had been a particularly cold day. So today when we set out, we were “welcomed” by a very cool breeze – perfect walking weather! We walked through the Louvre so we could reach the Seine and try to remember how to get to our first stop. Well-caffeinated, we then walked onto Promenade Plantee , a 4.7km elevated linear park built on top of an old railway line. From there, we took another walk to Parc de Bercy . 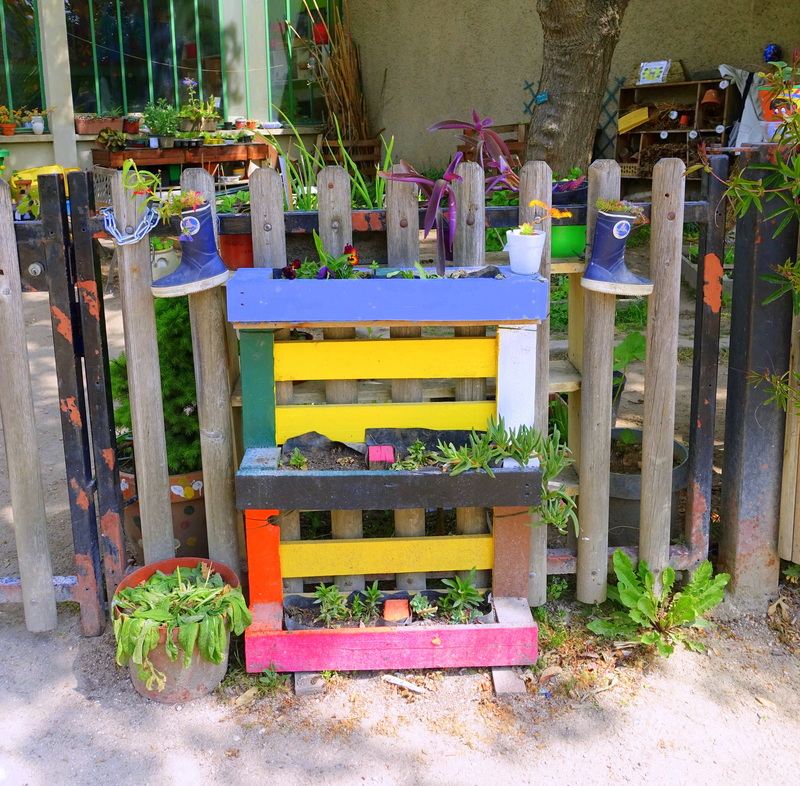 This project, instigated by President Mitterand, converted an old wine depot into three beautiful parks. 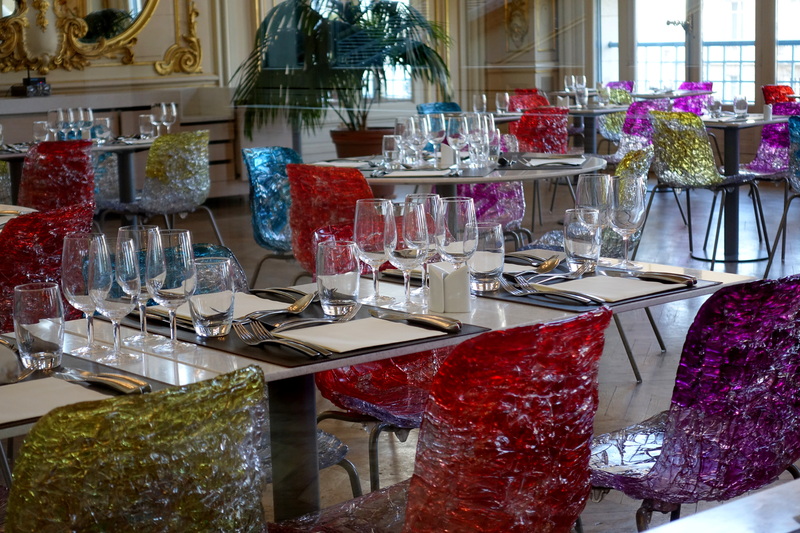 Continuing on, we aimed for Gare de Lyon (one of the large train stations in Paris) as I had wanted to visit Le Trein Bleu – a beautiful restaurant at the top of the train station. However, first we took a “detour” and walked over Passerelle Simone-de-Beauvoir – an expansive bridge solely for pedestrians and cyclists across the Seine River. 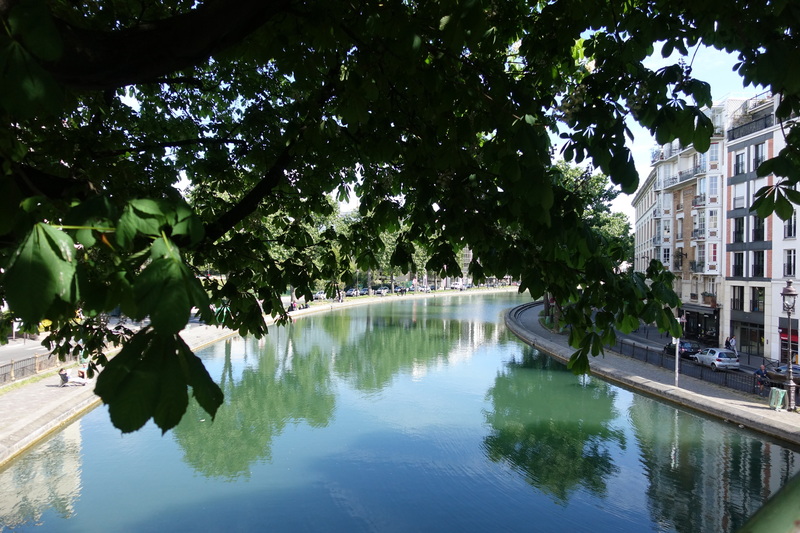 As we walked along the Seine, we passed the Josephine Baker pool – a giant barge that houses a floating swimming pool which is moored next to the Bibliothèque François Mitterrand. Finally we arrived at Gare de Lyon and entered the glorious Trein Bleu which was first opened in 1901 and underwent renovations in the 2014. We ordered a (very expensive – or as they say in France “tres cher”) cup of tea and Perrier and thought about how hungry we were. 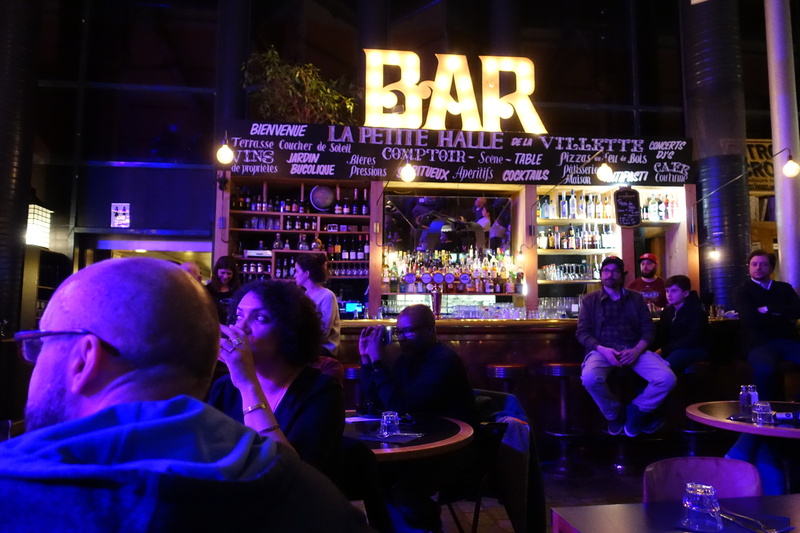 We then went downstairs to the much less costly bistro – Montreaux Jazz Cafe – it was like being moved from first class to economy but the lunch was great. 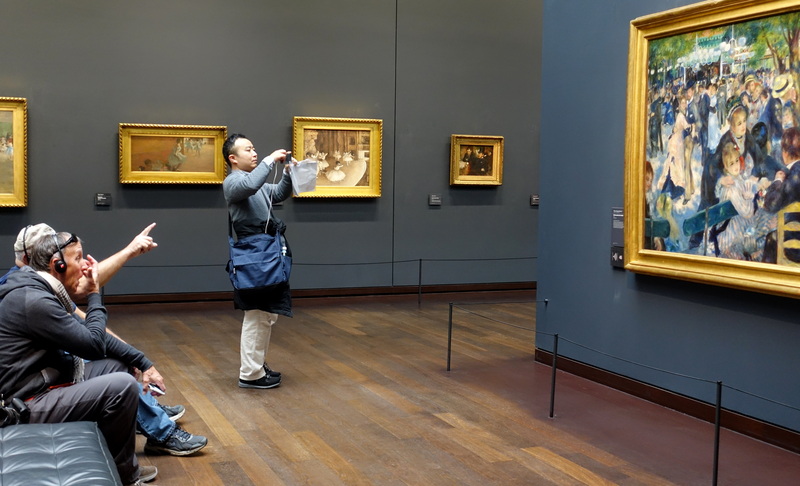 Last stop was Musee D’Orsay – however, on our arrival, I realised that I had left the tickets in the apartment so off home we set, via the beautiful Tuileries Garden. 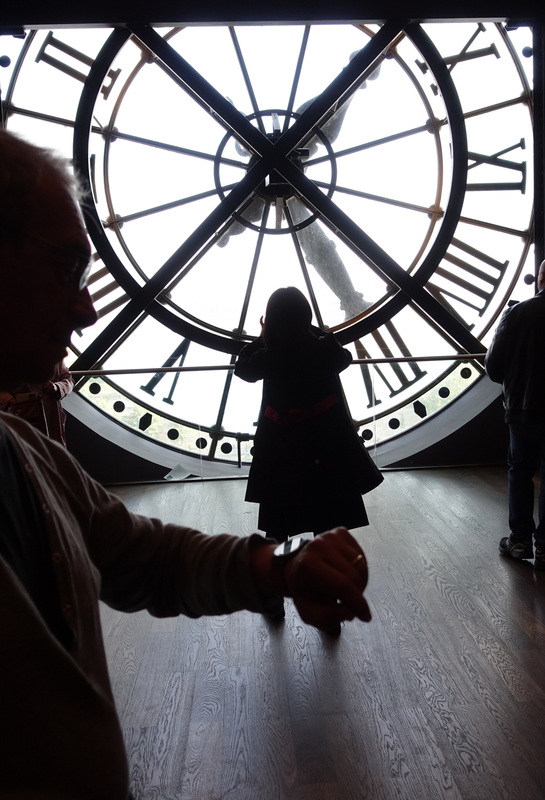 Never mind,the Musee D’Orsay – which houses a fantastic Impressionist collection of paintings – is open until late tonight, so we’ll go back. This will also rack up our walking tally to about 10 kms for the day. I’m preparing for another big Italian adventure (starting with France). Next Tuesday, Tony and I leave for Paris – I wonder what the mood of the city will be like after the attack on the Champs Élysées. I will let you know how the City of Lights is faring. We will also arrive not long after the 1st round of voting for the new French President. Interesting times indeed. 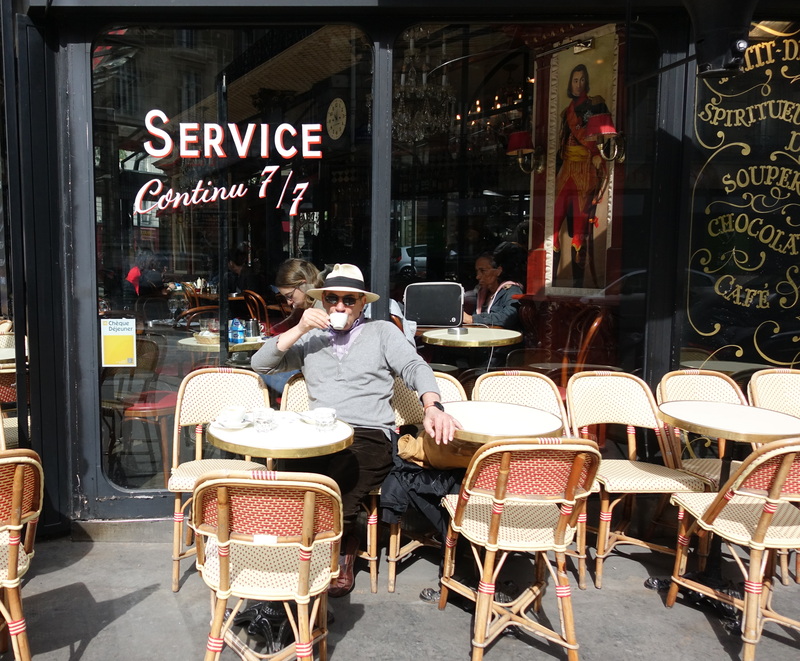 Of course, there are things in Paris that will never change – baguettes, croissants, the local bars and the fromage. So stay tuned as I take you on another tour of Italy (bookended by Paris and Prague). And so it’s time to call the last post. We hope you have enjoyed following our trip and thank you for taking an interest. All the best from the three wanderers. 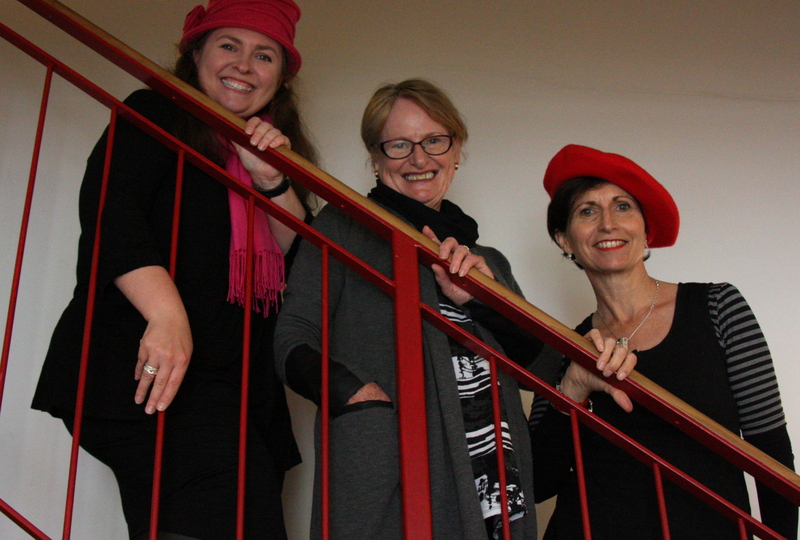 After the three travellers were reunited in Milan, we headed off to Como for a couple of days. 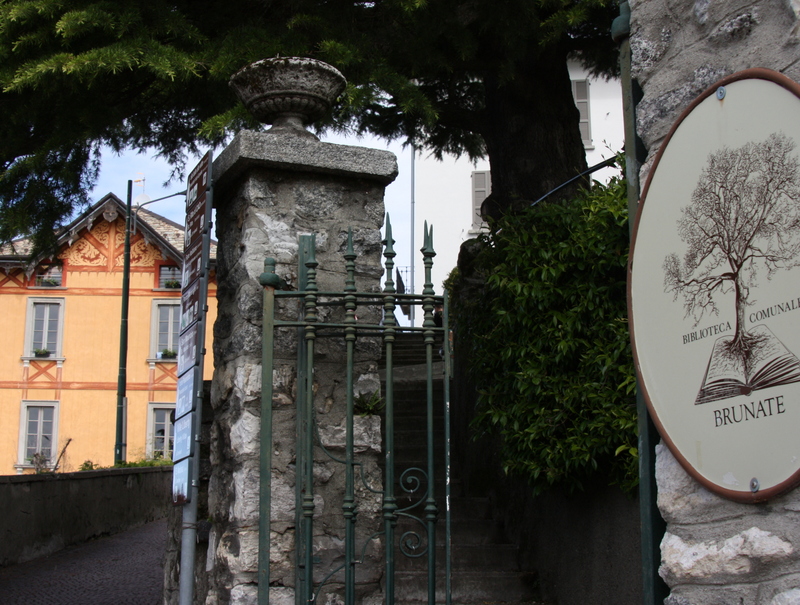 We had a lovely little apartment, a short walk from the centre of Como where we ventured out to have dinner. The next day, we awoke to rain but unperturbed, we walked into town, armed with umbrellas and wet weather gear. 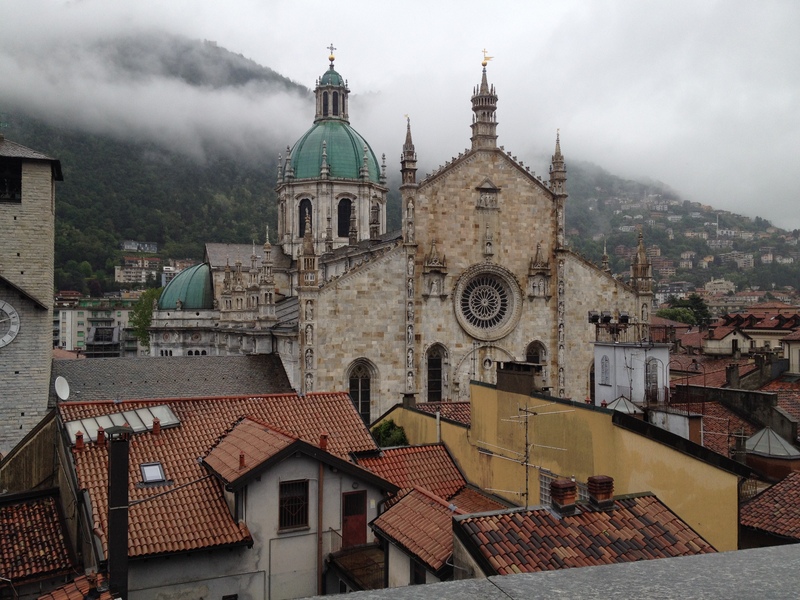 However, once it became clear the weather wasn’t going to clear, we took refuge on the top floor of Coin – an Italian department store – where we had a warming bowl of soup and fabulous views across to Como’s Duomo. We bumped into George on the ground floor of Coin. But things turned sour when we learned of his engagement. 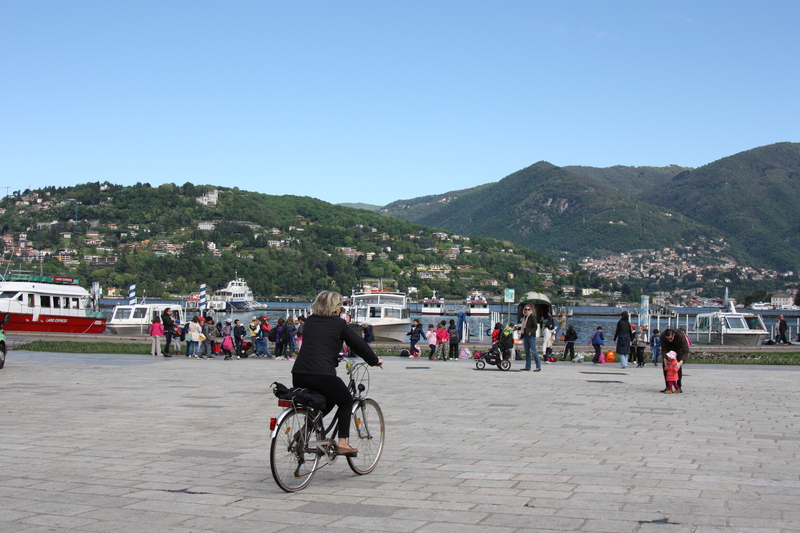 Regardless, we knew we needed to continue on, so we looked at silk scarves and walked over to the ferry to find out about trips around Lake Como (in the hope that the weather would clear). 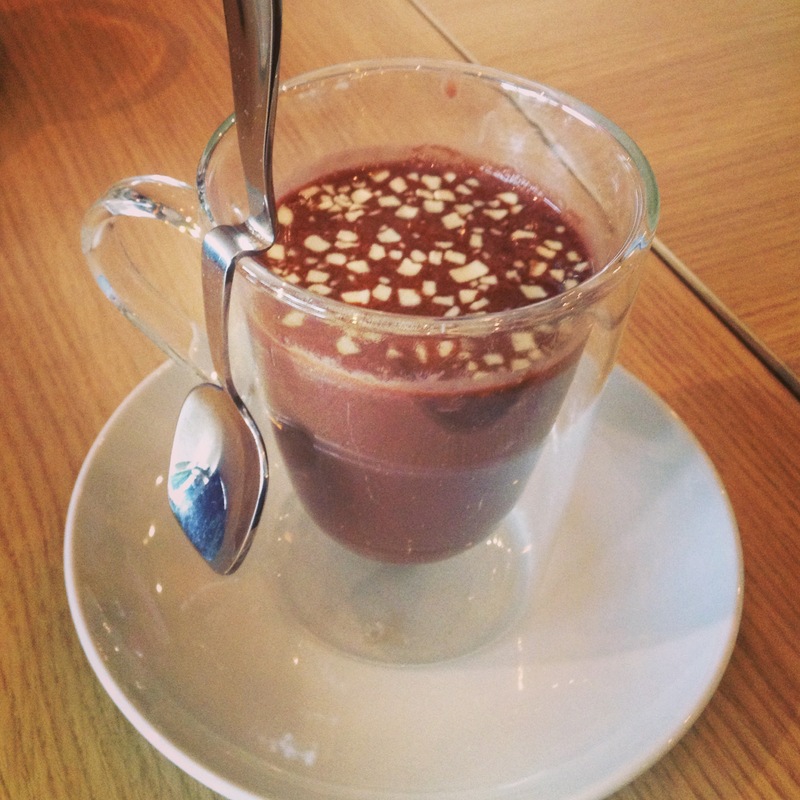 Again, time to warm up, this time with a hot chocolate (BTW, Italian hot chocolate is to die for, made with chocolate and milk). The next day, we were indeed greeted with sunshine and so we headed down to the shores of the lake. 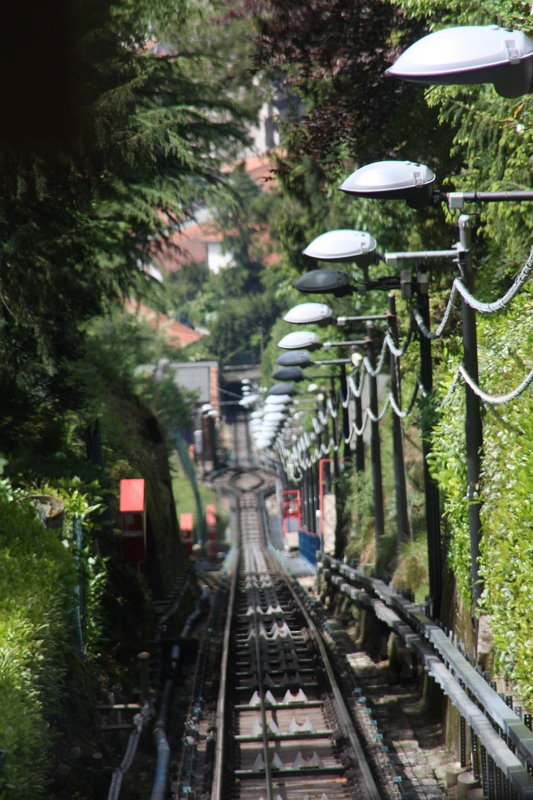 It was Aussiewally’s birthday and so, instead of the ferry trip on the lake, we took a walk to the next town and rode the funicular, up the hillside to the beautiful town of Brunate. 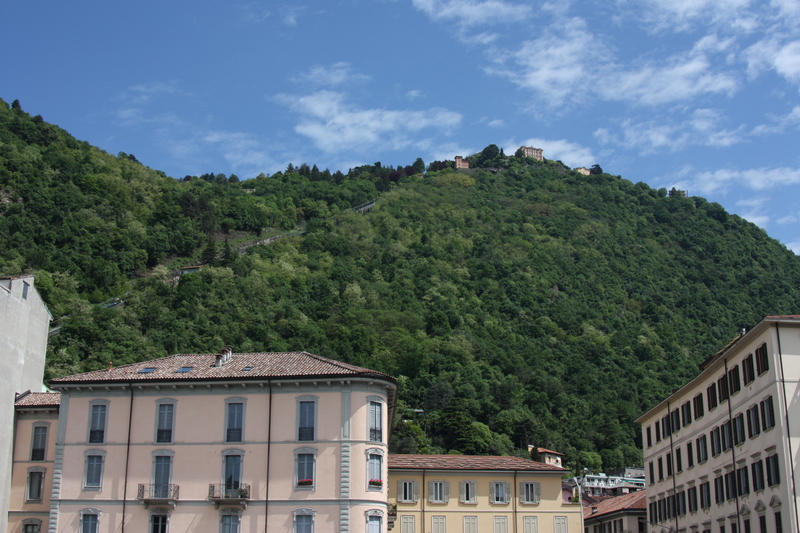 You can see Brunate at the top of the hill. 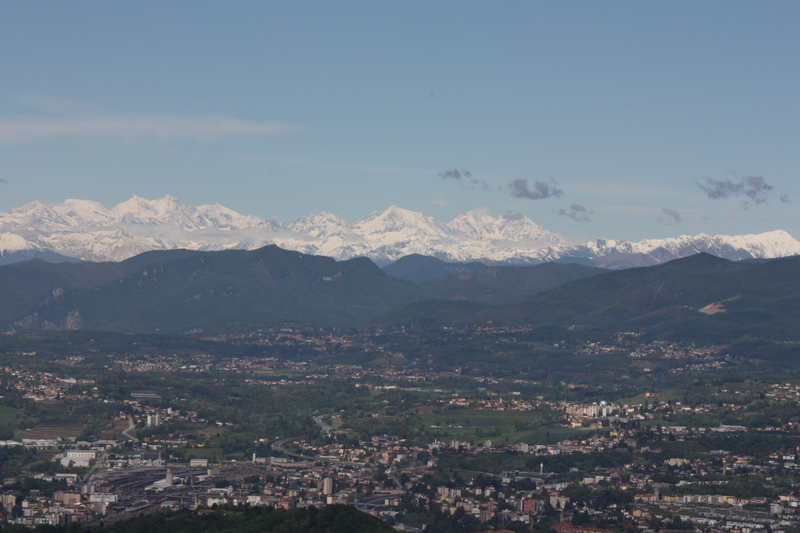 The view across to the Alps was outstanding. 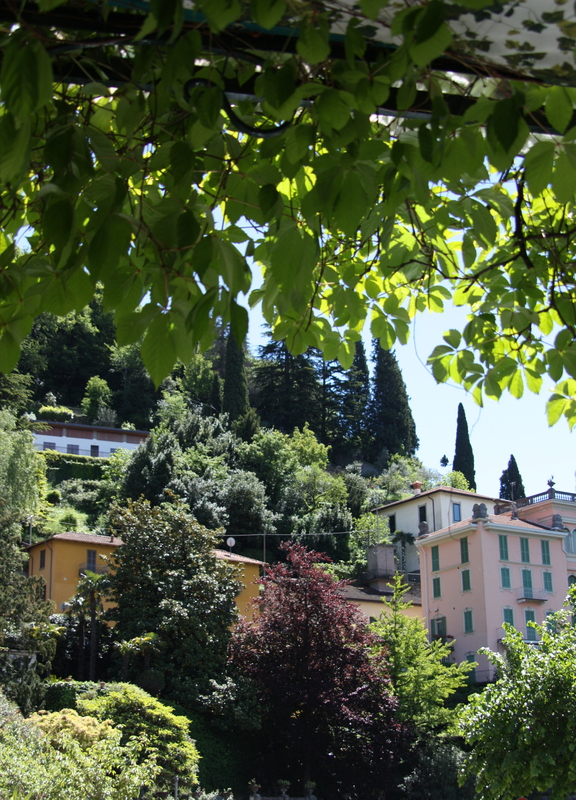 Brunate is a lovely town and we roamed around, taking in the views, the local businesses and church. 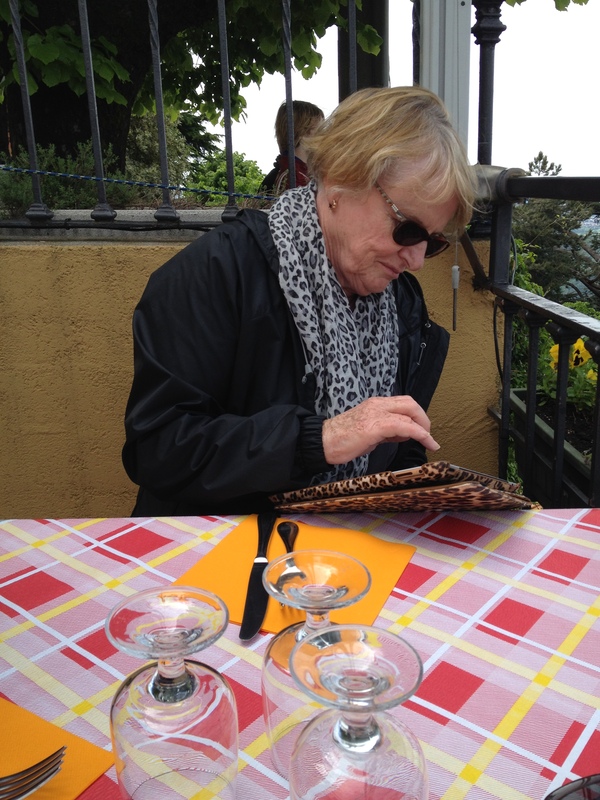 We then found a trattoria with the best view where we celebrated Sue’s birthday. 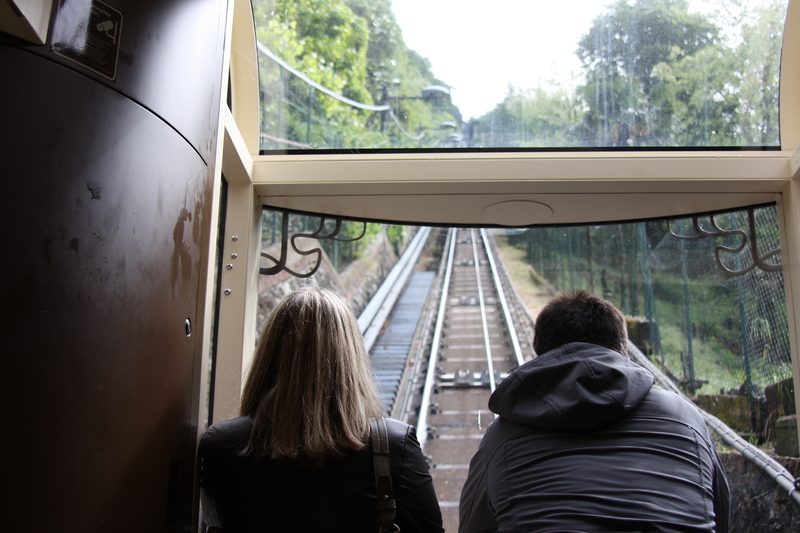 Then we headed back down the funicular. 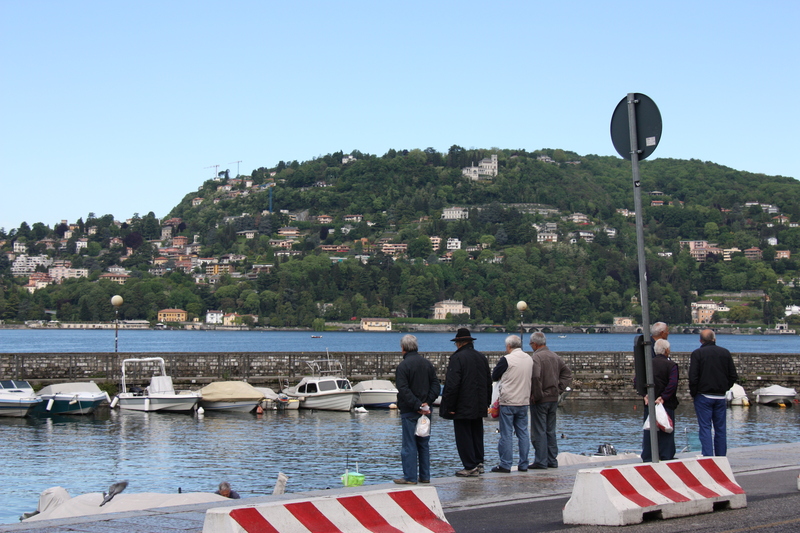 We walked back to Como, knowing that our bigitalianadventure was soon coming to a close. Enter your email address to follow Big Italian Adventure and receive notifications of new posts by email.